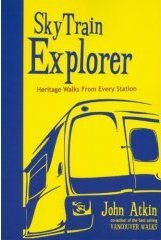 Starting April 2nd, 2006, I've been going on the walks described in SkyTrain Explorer: Heritage Walks From Every Station by John Atkin. In the pages that follow, you will find photos of the houses, streets, and views described in the book as well as passages from the book along with commentary by yours truly. It's an effort to get to know the town I've lived in for over 15 years, only hearing about the neighbourhoods but never really engaging with both the present and past of each neighbourhood. Starting a SkyTrain Explorer walking tour. Edwardian House on Scotia St. Looking North on Ontario St. Seeds and Feed Advertisement on the Back of 250 Terminal Ave.
SkyTrain Elevated Guideways Near Main St.
English Revival House on 3915 Slocan St.
Vancouver Specials on North Side of the 2600 Block of E. 24th Ave.
View Looking North on Boyd St.
View of the Mountains from Kaslo St.
Angled Door at 2442 Brock St.
Duchess St. Intersects With Duke St.
Heritage Gate 2960 E. 29th Ave.
John Norquay Elementary School Seen from Duchess St.
View from Kamloops St. and E. 29th Ave.
BC Hydro Substation on 5400 Block of Joyce Ave.
1715 Nanaimo, New Westminster, "with its corner entrance and large central gable"
"1621 7th Avenue is a delightful and well preserved example of a style known as Spanish Colonial or Mission Revival"